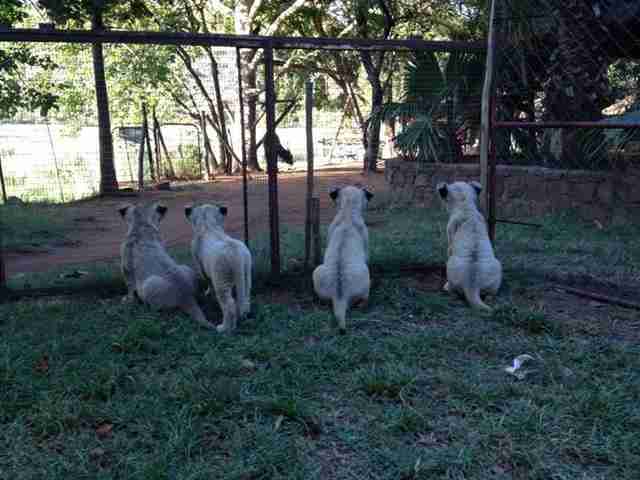 "So many people didn't know about canned hunting. They were like me." When she decided to travel all the way from Quebec, Canada, to volunteer at a wildlife facility in South Africa, Alexandra Lamontagne thought she was doing it for the good of animals.While she was originally planning to help out with the organization's monkeys, when Lamontagne arrived, back in 2013, she was informed she would instead be caring for five baby lions who were supposedly going to a zoo in Denmark in a few months. When she decided to travel all the way from Quebec, Canada, to volunteer at a wildlife facility in South Africa, Alexandra Lamontagne thought she was doing it for the good of animals. 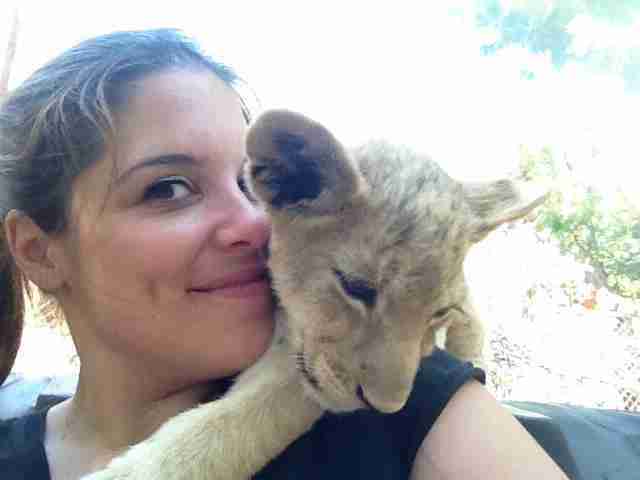 While she was originally planning to help out with the organization's monkeys, when Lamontagne arrived, back in 2013, she was informed she would instead be caring for five baby lions who were supposedly going to a zoo in Denmark in a few months. 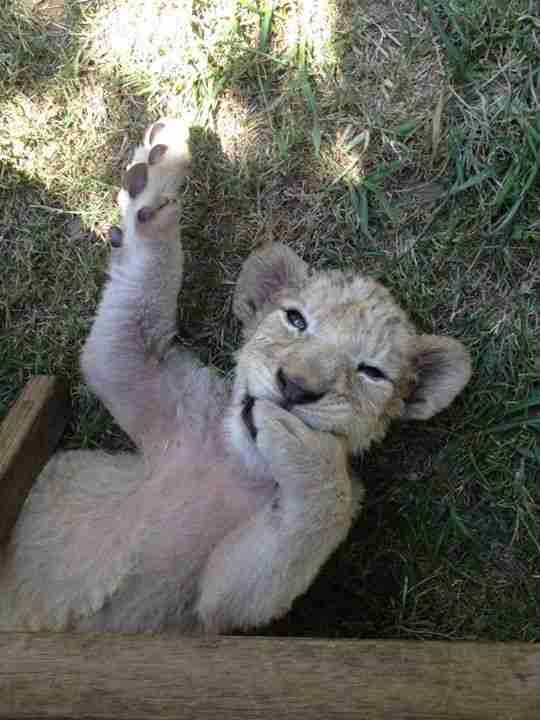 Lamontagne didn't know what was really going on at the facility where the baby lions were kept. As her stay at the facility progressed, she found herself bonding with the five cubs in her care, especially the youngest, Serabie. She would often bottle-feed Serabie, who would slowly fall asleep on her lap. 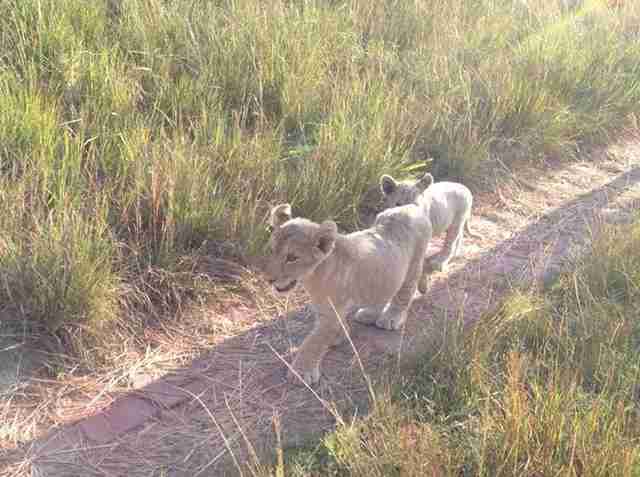 Only after Lamontagne's return to Canada did she hear rumors that the lion cubs she'd helped raise, including the littlest Serabie, would be sent to a "canned hunting" facility. 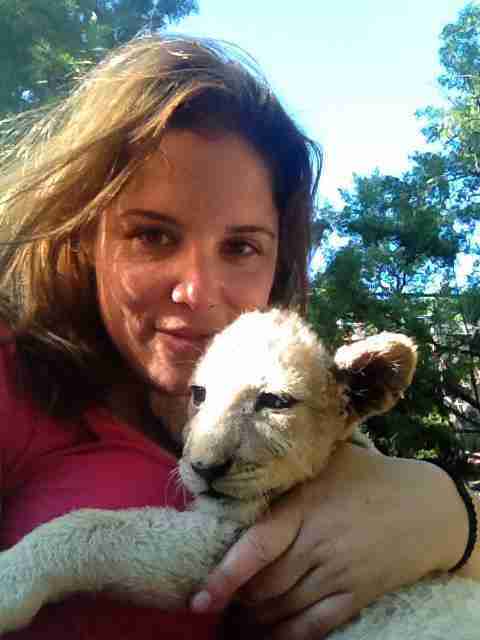 "Canned hunting" is a horrific practice, one Lamontagne had never heard of. "Canned hunting" essentially takes lions who are bred in "lion farms" and markets them to hunters who are looking for an easy, but impressive, target. Hunters can go online, browse images of available lions and, when they find one whose head they'd like to hang on their wall, place an order. After traveling to a canned hunting facility in South Africa (or even in the U.S.) these paying clients are given guns and escorted out into a small enclosure where their animal has been corralled for them. 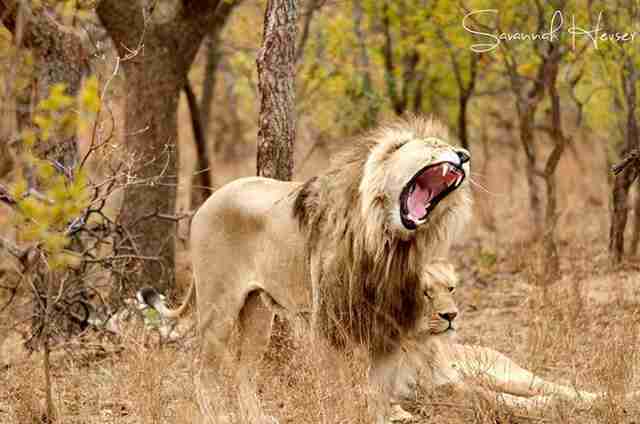 Sometimes a lion is drugged to make him - the target - easier to shoot. Then the lion, who has learned to trust people, having been hand-raised for this very purpose, is shot as many times as it takes. 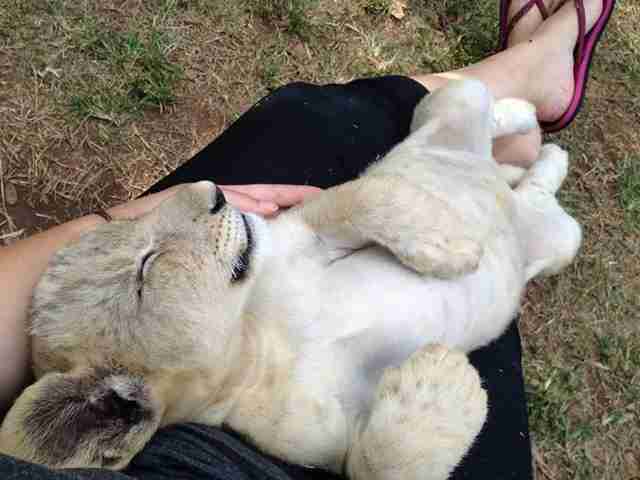 Baby lions, like Serabie, are often raised by vacationing volunteers, like Lamontagne, who believe they are helping animals and who rarely even know the bloody end that awaits these cubs. "I tried to find out, but I was never able to know the truth," Lamontagne said of her time at the facility. She was appalled when she learned Serabie was born just to be shot - and she knew she had to do something. "She is so perfect," Lamontagne told The Dodo, of the striking photos taken of Serabie as a baby. "So you understand how in love I was." Determined to save Serabie, she asked the help of everyone she knew. 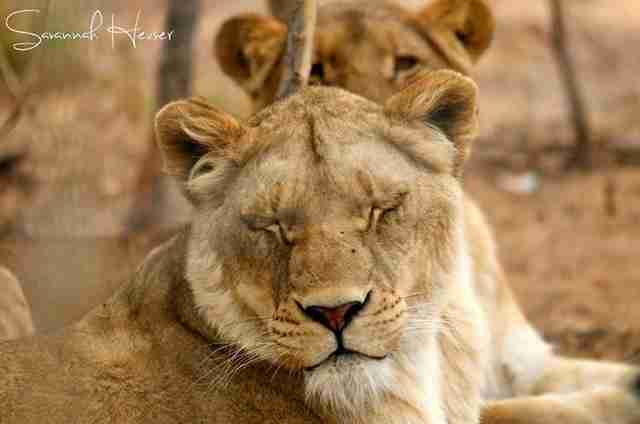 "So many people didn't know about canned hunting. They were like me at the beginning," she said. Finally, after raising enough funds through social media platforms, Lamontagne had enough money to buy Serabie's freedom, so she traveled back to South Africa to change Serabie's fate. 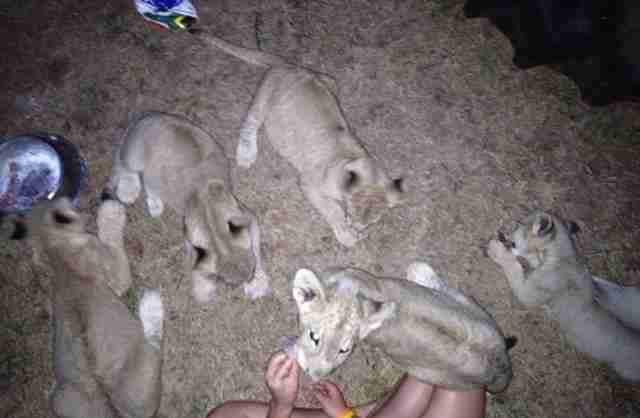 When she returned to the facility, Lamontagne found Serabie in an enclosure with 14 other cubs. As Lamontagne looked around, she noticed there were new, younger cubs at the facility as well, in another enclosure. In yet another were larger lions Lamontagne knew would probably be sent to an undisclosed canned hunting facility to be killed. 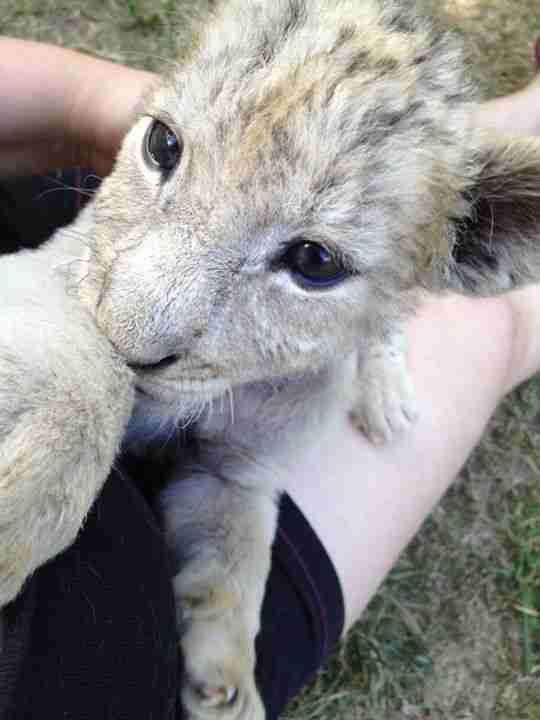 So many lion cubs were being raised just so hunters could buy the right to shoot them. "It was very painful because you know you're taking one, but all the others are going to get shot," Lamontagne said. Lamontagne did what she could: She prepared Serabie for a trip to Emoya Big Cat Sanctuary, where the young cat would get the privilege of which so many others were robbed: Serabie would be able to live out her life. Even after the rescue, Lamontagne couldn't eat, sleep or stop crying because the thought of the other lions being killed was too horrific. But word was starting to get out. 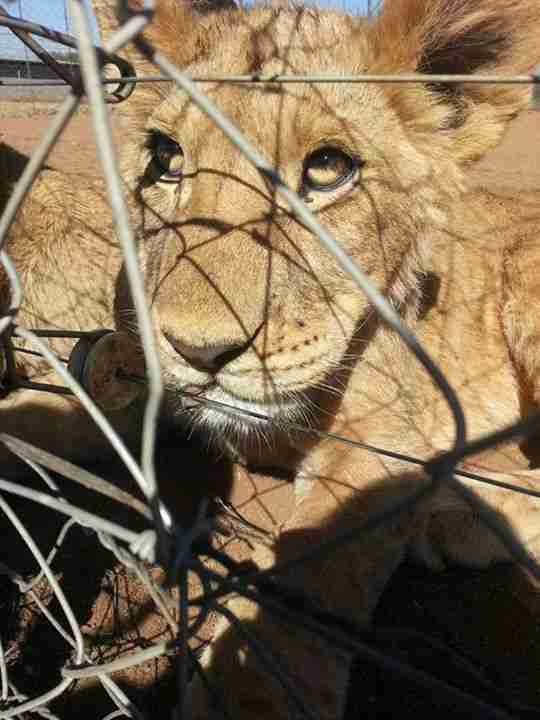 Lamontagne was interviewed for the new MSNBC documentary "Blood Lions," an exposé on the canned hunting industry. 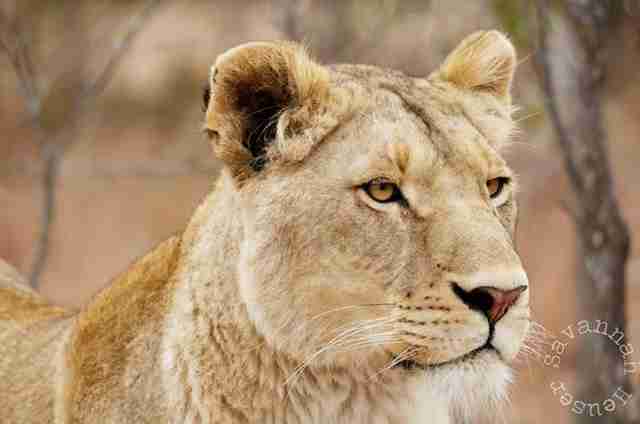 Serabie's story was also turned into a video to raise awareness about canned hunting. "This was the whole point," Lamontagne told The Dodo, "to make people know about this horrible practice." More and more people are working to show how horrific this kind of hunting is. Because of loopholes in reporting systems and shoddy data-keeping, it's impossible to know exactly how many lions are born to die every year in canned hunts. But according to "Blood Lions," which compiled data from the South African Predator Association, the Convention for the International Trade in Endangered Species (CITES) and various other governmental and provincial bodies, it's estimated that anywhere between 800 and 1,000 lions are being shot annually just in South Africa, and just over 50 percent of these hunters come from the U.S. While far too many lions are being born merely to die every year, Serabie, miraculously rescued from this industry, has grown up to become a beautiful lioness at the Emoya Big Cat Sanctuary. 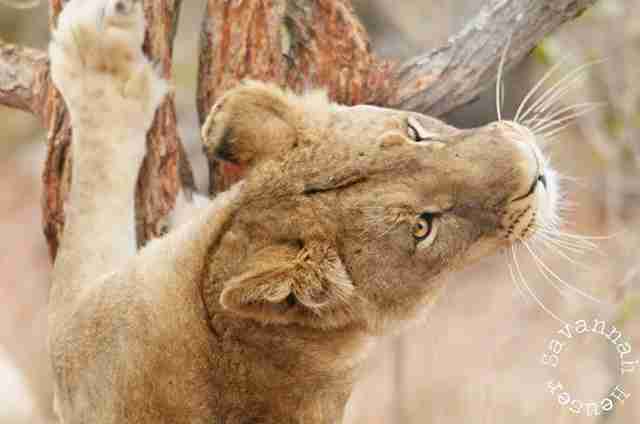 At the sanctuary, Serabie enjoys being around other rescued big cats, like her lion friend, Raka. 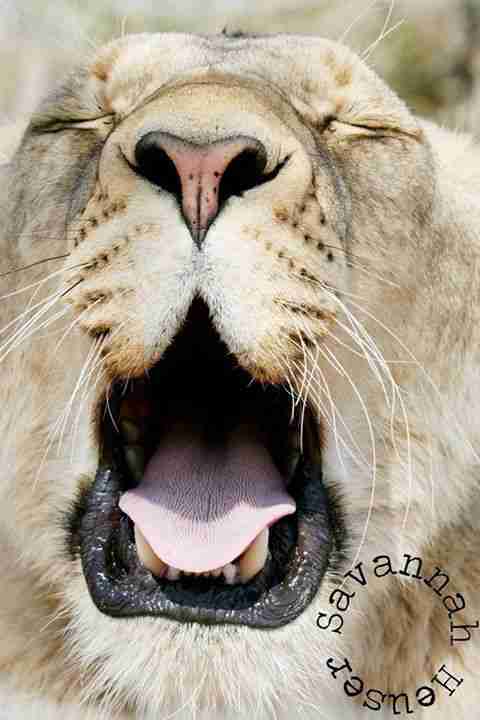 She also has a lioness friend, Chanel. "I just hope by saving her I made a little difference in this horrible practice, because I saw so many other lions where Serabie was and it's still painful that I couldn't save them all," Lamontagne said. "It was so important to show people that killing an animal is not right. That animal does recognize you and they have feelings, too." While Lamontagne hasn't seen Serabie in person since the rescue, she hopes to visit Serabie at the sanctuary next year. To help care for Serabie and other rescued cats, you can make a donation here.